As the fifth largest city in the United States at the turn of the last century, Cleveland once prospered as one of the nation’s central transportation and manufacturing hubs. But like many midwestern cities, its economy faltered during the mass deindustrialization that swept the country during the late 1970s, a position from which it is, in many ways, still recovering. Today, Cleveland wears of a mix of beauty and brawn as evinced in the photographic installation Then and Now (2018) by Allen Ruppersberg, a Cleveland native, at the Cleveland Museum of Art (CMA). Street scenes and sweeping vistas of the city’s skyline taken from the vantage point of various billboards are illuminated in a series of LED light boxes, each framed by a photomural of the billboard’s steel support. Across the work’s eight scenes, one views remnants of Cleveland’s industrial past in tandem with signs of growth and new development, together offering a panoramic view of a city in transition. 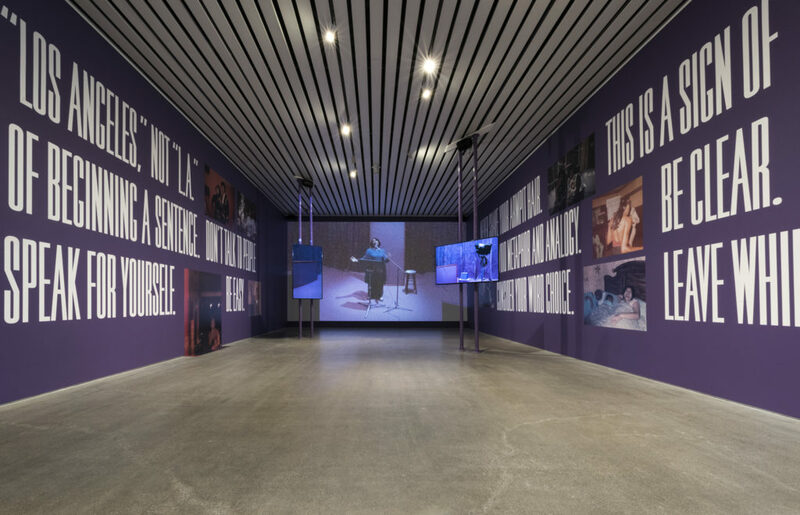 Martine Syms, installation view at the Museum of Contemporary Art Cleveland, July 14—September 30, 2018. FRONT International: Cleveland Triennial for Contemporary Art. Courtesy of the artist and Bridget Donahue, New York. Photo Credit: Field Studio. Lambri, whose photographs deconstruct iconic buildings and male architectural histories with a poetic subjectivity, is one of a few female artists, in addition to Martine Syms and Candice Breitz, given either a significant institutional showing or large-scale commission within Cleveland. (Both Barbara Bloom and Cui Jie have solo exhibitions in Oberlin.) Syms’ An Evening with Queen White (2017), at the Museum of Contemporary Art (MOCA) Cleavland, performs constructions of black female identity in this four-channel video work presented across three monitors and a projection screen. The central protagonist, Queen White, is an invented character based on Syms’ great aunt Maxine Powell, an etiquette instructor at Motown Records, personified by actress Fay Victor in an improvisational monologue. In the related 99 Subtle Maneuvers (2018), enlarged photographs of the artist’s family are scattered amid declaratives such as “Always speak for yourself,” “Be clear,” and “Never shave your armpit hair,” emblazoned in large white letters upon Motown-purple walls. Michael Rakowitz, detail from A Color Removed, 2018. July 14-September 30, 2018. SPACES, FRONT International, Cleveland Triennial for Contemporary Art: Courtesy of the artist; Rhona Hoffman Gallery, Chicago; Jane Lombard Gallery, New York City; Galerie Barbara Wien, Berlin; The Beamer-Schneider Professorship in Ethics at Case Western Reserve University, The Tamir Rice Foundation, and SPACES, Cleveland. Photo Credit: Jerry Mann. While wonderfully suited to their individual sites—as were other installations, including Allan Sekula’s maritime-themed film Lottery of the Sea (2006) shown aboard a retired steamship—such works have garnered considerable attention elsewhere on the global art circuit. What they bring to FRONT, and Cleveland, aside from international visibility is the opportunity for understanding broader cultural conflicts in a city and region that have played a crucial role in contemporary American electoral politics.3 But just as Jacobs saw neighborhoods as the lifeblood of cities, the real strength of FRONT exists through the projects that are sited in alternative spaces and neighborhood venues, making visible local histories and social issues of importance to both their respective communities and beyond. These embedded practices succeed in their deep commitment to place. The emotional traumas of police violence on black lives are the focus of A Color Removed (2018), an ambitious, multilayered exhibition and collaborative project led by Michael Rakowitz at SPACES gallery in the Ohio City neighborhood. Created in response to the 2014 murder of 12-year-old Tamir Rice, fatally shot by a police officer in a public park in Cleveland, inciting public protests nationally, the project advocates for social justice and the right to safety. The title refers to the orange safety cap missing from Rice’s toy gun, which was mistaken for a real firearm at the time of the shooting; it is also a call to action for the removal of all orange-colored objects from the city, collected by the public and placed in depositories throughout Cleveland. 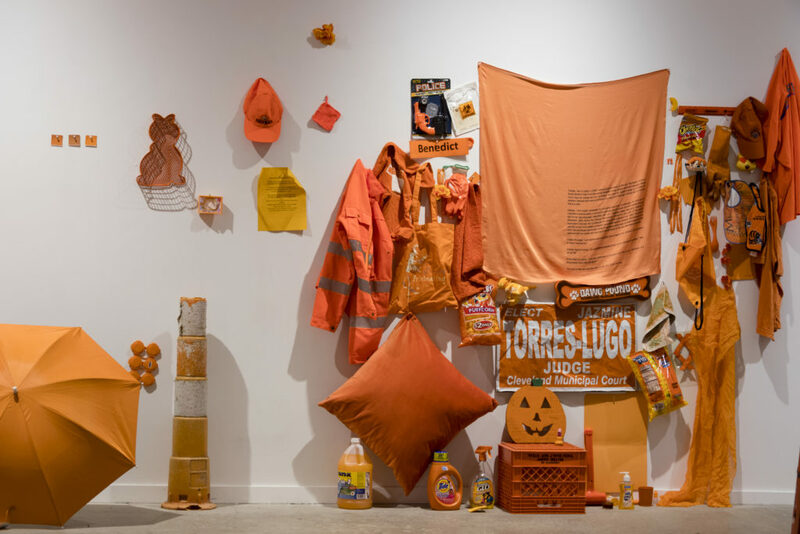 The gathered items—including household products, safety vests, construction tools and traffic pylons—form the artefactual basis for a gallery-wide installation that renders the objects’ utilitarian functions useless. A Color Removed includes related works by several Cleveland-based artists and is simultaneously conceived of as a community space for public discussions, dinners, and other events, many co-organized with the Rice family. Dawoud Bey, installation view of Night Coming Tenderly, Black, 2017. July 14 – September 30, 2018. 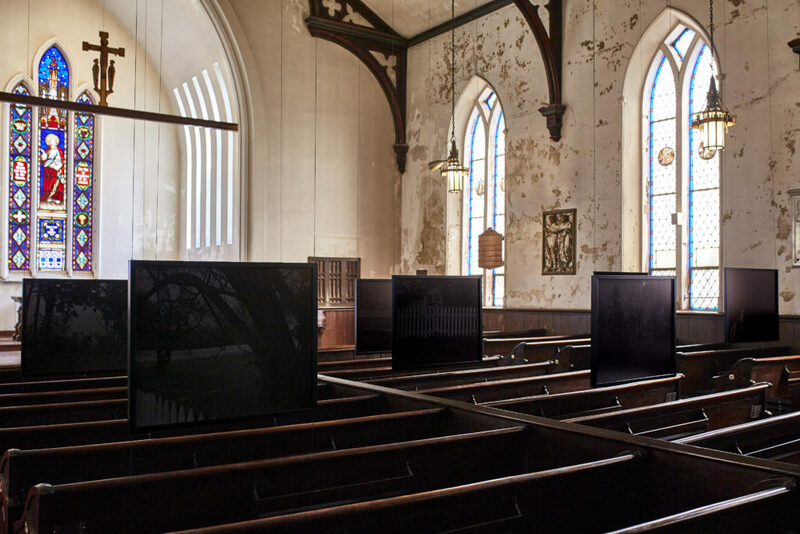 St. John’s Church, commissioned by FRONT International: Cleveland Triennial for Contemporary Art. Courtesy of the artist, Rena Bransten Gallery, and Stephen Daiter Gallery. Photo Credit: Mike Majewski. Coleman’s project, one of the few commissioned pieces by an Ohio-based artist, bridges the institutional spaces of MOCA and communities like Glenville, at the same time it symbolizes the kind of self-reflexivity that projects like FRONT offer and pledge. As one of a new crop of regional art biennials focused on the Midwest—including Open Spaces in Kansas City—FRONT suggests a growing need to align smaller cities and communities within cultural dialogues happening elsewhere, and yet remain responsive to local interests and context. Such strategies belong to a critical regionalism that is neither provincial nor parochial, but very much engaged with a broad set of social and political dynamics that simultaneously inform the local and the global. These dynamics could have been pushed further with more visibility given to regional artists outside the Great Lakes Research project, a group exhibition of twenty-one artists from the greater Midwest at the Cleveland Institute of Art. However, FRONT succeeds first and foremost by offering an experiential encounter with Cleveland. Rather than emulating documenta—particularly given the issues that plagued the last edition where the economic conditions of the Athens site clashed with the artworld festivalization—FRONT has the ability to establish its own model. Best practices bring cultural capital and creative resources to artists from the region, as well as new models of civic engagement that serve local citizens long after the first wave of visitors have left town. 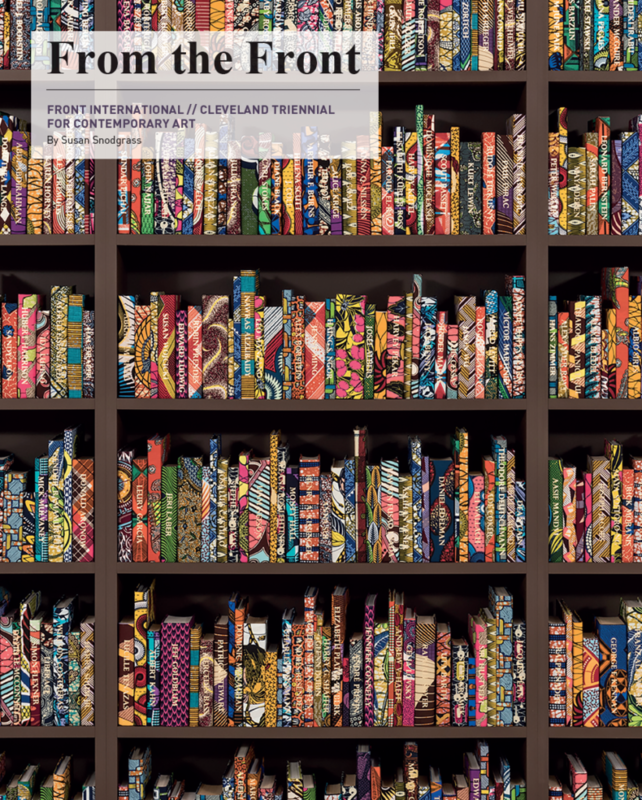 FRONT International: Cleveland Triennial for Contemporary Art runs from July 14–September 30, 2018. September 26, 2018 | Filed under Art Seen: National and tagged with Cleaveland, Front, Martine Syms, Michael Rakowitz.